The following is the full procedure for installing the AMBER force field port for GROMACS (AMBER-in-GROMACS, AMBER-with-GROMACS, AMBER-on-GROMACS, whatever you want to call it) developed by Eric Sorin at California State University, Long Beach, providing a bit more depth in the installation process (specifically for GROMACS 3.3.x) and a few modified GROMACS files. As brief background, AMBER (Assisted Model Building and Energy Refinement) is one of THE dominant molecular mechanics/molecular dynamics (MM/MD) force fields used today in biochemical simulations. The motivation for this page (my installing AMBER for use in GROMACS) stems from the current Nanorex focus on Structural DNA Nanotechnology (SDN) modeling, for which we’re working on a reduced model force field for large-structure energy minimizations and, importantly, integrating the GROMACS MM/MD package for use via our CAD interface. 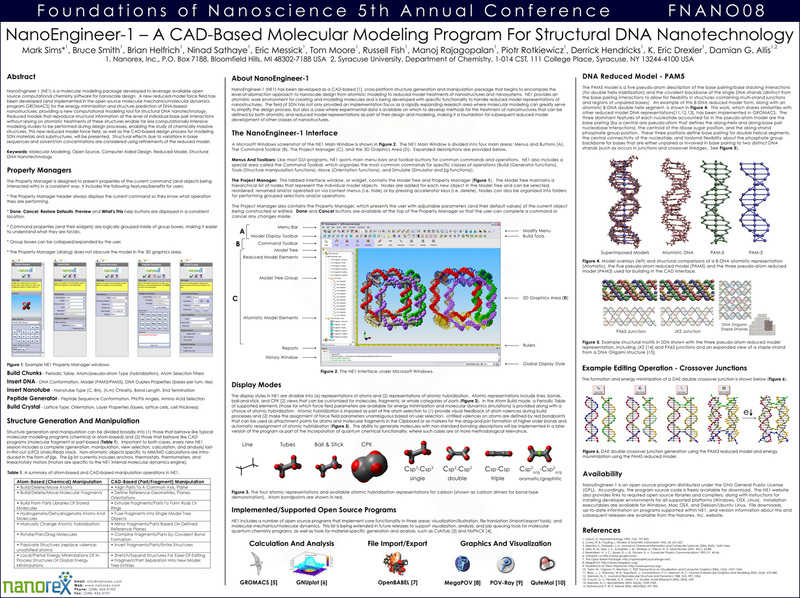 You can read more about this in the poster presented at FNANO08 this past April. As a force field validated for DNA simulations, AMBER meets our needs of performing atomistic simulations on DNA nanostructures. 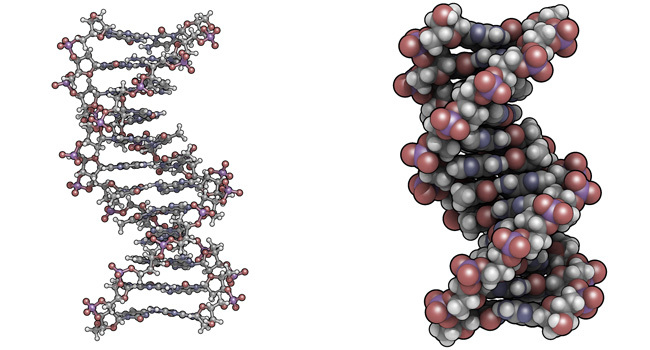 While NAMD is also a possibility for DNA simulations, GROMACS meets Nanorex’s open source needs. Needless to say, finding that Sorin and co-workers had ported AMBER to GROMACS was a wonderful discovery (and that this same port appears to be driving the Folding@Home project). The installation directions on the AMBER-on-GROMACS website are good, but they don’t mention a few important steps that I spent no small amount of time trying to figure out (and I’m definitely not complaining. 99% of the work was the porting, which has been graciously handed to the GROMACS community on a silver platter). Below is the complete set of steps required to get, as the first example, the Dickerson.pdb sample file provided with the porting files to energy minimize and MD correctly. Issues related to DNA-based simulations not using the Dickerson.pdb file will be covered in another post. QuteMol rendering of Dickerson.pdb (from Drew, H. R., Wing, R. M., Takano, T., Broka, C., Tanaka, S., Itakura, K. & Dickerson, R. E. (1981). Structure of a B-DNA dodecamer: conformation and dynamics. Proc. Natl. Acad. Sci. USA 78, 2179-2183. Protein Data Bank structure 1BNA). The AMBER port to GROMACS does not require modification of the GROMACS code but does require a few changes to force field text files. In the interest of remembering what was changed and what wasn’t, I recommend a custom compilation of GROMACS or, at the very least, the installation of another copy of GROMACS you can modify the top directory of without risking changes to an already working GROMACS version. If you don’t know how to compile your own version of GROMACS, I recommend taking a look at Compiling Single-Precision And Double-Precision GROMACS 3.3.3 With OpenMPI 1.2.6 Under OSX 10.5 (Leopard). My installation directory is /usr/local/gromacs333-amber (which I will refer to here as /ULG-A/ and all directory calls will be to this. Obviously, change all directory calls to match yours. I’m running a double-precision MPI version of GROMACS 3.3.3, meaning I’m using the GROMACS-ported AMBER force field files for GROMACS 3.3.1 (May 2006). And get the version “with pdfs.” If you’re going to be doing these calculations, you should know where the math come from! With no removals or number changes. The aminoacids.dat file is a little different. In order to use pdb2gmx to generate nucleic acid topology files, GROMACS requires the list of residue codes that reside in aminoacids-NA.dat. So far as I can tell, using aminoacids-NA.dat instead of aminoacids.dat does not change the handling of amino acids (why two files exist for a reason other than amino acid-centric organization is beyond my pay scale), so we’ll be using aminoacids-NA.dat exclusively. If you’re doing this in Linux or OSX, you might as well move all of the files you want installed into a single directory and su cp * /ULG-A/top. Note that the .itp and .gro files in your ffamber_v3.3.1 (for the 3.3.x GROMACS) are the same for all of the AMBER force field flavors you can install. Further, all of the ffamber* files have unique names (94, 99, 03, etc. ), so you can install all the force field files into /ULG-A/top and use whichever. The GMXRC file contains path-dependent settings for your shell. In theory, you’re all done. At least, this is the end of the installation process according to the official AMBER-on-GROMACS list. The IMPORTANT NOTES section contains relevant information but does not complete the installation. The additional steps are provided below. Atom index (1) in bonds out of bounds (1-0). This probably means that you have inserted topology section "bonds"
in a part belonging to a different molecule than you intended to. In that case move the "bonds" section to the right molecule. ; i     j       funct   length  force.c. ; i     j       k       funct   angle   force.c. Similar to the spc.itp error, the error that comes up with the inclusion of counterions confounds the mind because everything seems to be in place. Our AMBER ports include common ion definitions, which are listed in the ffamber*.rtp files (just below the TIP water models). This allows the AMBER ports to be used without modification or use of the GROMACS ions.itp file. At the moment these include Cl- , IB+, Na+, K+ , Rb+, Cs+, Li+ , Ca2+, Mg2+, Zn2+, Sr2+, and Ba2+. If your pdb file has ions present and pdb2gmx does not properly convert those ions, please check the atom and residue name of your ions and rename them if necessary to agree with the .rtp file. If you are using ion-related GROMACS tools, such as genion, you will need to enter the AMBER ion definition to the ions.itp file in the “top” directory of the GROMACS distribution. The bases for the ion use are in the .rtp files, but the implementation, at least for GROMACS 3.3.3 and possibly earlier versions, is not as found in these files. This is the format used for the FF_GROMOS96 ions with one change. The atom type for the FF_AMBERXX parameters is NOT the atom label, but instead the AMBER force field label. In the case of Na, this is amber94_31 (for AMBER94) and amber99_31 (for AMBER99). Note that the mass must be specified (you have to scroll down the ions.itp file to see FF_GROMOS96. FF_GROMACS does not require mass specification). For quick reference, here are the following [ atoms ] specifications for FF_AMBER94 and FF_AMBER_99. With the ions.itp file complete, your GROMACS energy minimizations and dynamics simulations of amino acid and nucleic acid structures should go without hitch. My thanks to Alan Wilter S. da Silva, D.Sc. – CCPN Research Associate, Department of Biochemistry, University of Cambridge, for catching a formatting error in the first version of the amber_ions.itp file. If you find problems, questions, concerns, incompatibilities, etc., please let me know by setting up a user account and posting a comment in this post or email me so I can post whatever you might find. And don’t forget to cite ffAMBER if you use it!